We all love a trip to the beach, but the sun presents a few problems for your baby. Without the proper protection, your baby may end up getting sunburned. Extended ultraviolet (UV) radiation exposure can also lead to a range of other health conditions. Sunscreen helps, of course. But you need another layer of protection, both to keep your baby shielded from the sun and to ensure they don’t go wandering off. That’s where a baby beach tent can help you. With a beach tent, you not only protect your baby from the sun, but any of the other elements that may affect your day on the beach, such as wind. It’s just that added peace of mind that can make the whole trip go smoothly. I had a few criteria in mind when approaching this list, including size and level of UV protection that each tent had to offer. I’ve also spoken to a few parents about their experiences with tents, and realized that tent stability is just as important. I’ve taken those factors, and several others, into account to create this list of seven great baby beach tents. When you’re at the beach, you don’t want to spend too much time fiddling around with tent poles. The Easy Up solves that problem, popping into place almost instantly once you unfurl it. You’ll have it set up in a matter of moments, and it’s just as easy to pack away too. 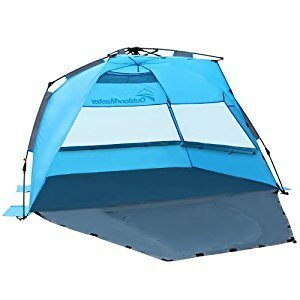 The lightweight construction is also a plus point, as it makes the tent easy to carry if you have to trek across the beach to find a quiet spot. It weighs less than five pounds, but is much larger than that light weight would have you believe. It stands 47 inches tall and 87 inches wide, with a depth of 49 inches. A lot of care has gone into the construction, as it has a strong fiberglass frame, and a waterproof polyethylene (PE) base. You can pitch it onto wet sand without worrying about water seeping in through the bottom. The tent itself also guards against intrusion from wind and rain, plus it has an Ultraviolet Protection Factor (UPF) of 50+. This means that only 1/50th of the sun’s UV rays penetrate the tent, offering ample protection for your baby. I particularly like the inclusion of the internal pouch, and the mesh windows have little drapes which offer further protection for your little one. It’s portable too, folding into a compact package that slides easily into the trunk of your car. You receive a carry case, plus four stakes to secure it to the ground. Pacific Breeze also offers a one-year limited warranty, and you can contact them via phone or email. Unfortunately, the mesh windows don’t allow air to circulate as well as I would like. The tent can become uncomfortable on really hot days, especially if there’s very little wind. It would also be nice to have an option for closing the front wall for added protection. Another pop-up beach tent, the OutdoorMaster requires almost no assembly to get it ready to go. You just lay it flat and use the top of the frame to pop it into place. Six beach pegs and a couple of sandbags later and it’s secured to the ground and ready to use. The tent fabric has a UPF 50+ rating, so the sun shouldn’t cause an issue for anybody inside. I also really like the inclusion of a door, which you secure with a zipper. Not only does this offer added protection from the elements, but it also allows the tent to double as a private changing room. It’s also quite large, with its 50-inch height and 95-inch base. 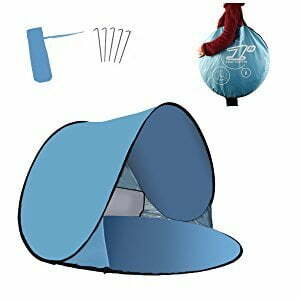 Better yet, the tent comes with iron pegs as well as beach pegs, so it’s just as comfortable on grass as it is on sand. The outer fabric is 3000mm nylon, which offers some protection from the rain. However, you may find that water still finds its way in during very heavy downpours. The fabric also has mesh windows on the back and side, which aid with ventilation. The tent has a back-mounted storage pouch and comes with its own carry case. When packed away, it weighs a little over eight pounds, so you shouldn’t have any problems carrying it. Having said that, I’d have liked the carry case to be a little larger, as it’s tough to pack the tent away after a long day. I’d also recommend using the packaged instructions to help with set up, as the tent’s online tutorial video doesn’t cover all of the steps. One of the smaller tents on my list, the Play Shade may be a great choice for parents who want to give their babies a little space of their own on the beach. You can set it up alongside your own beach tent so everybody doesn’t have to cram in together. The tent’s waterproof polyester fabric has a Sun Protection Factor (SPF) of 50+, and it pops into place in less than a minute. At 31 inches high and 51 inches wide, it doesn’t offer much extra room for parents. However, you should be able to sit inside it with your baby without too much discomfort, should you need to breastfeed or change their diaper. It comes with four pegs, and a couple of sand pockets on the outer sides. You can fill these pockets with sand to weigh it down further and ensure that gusts don’t blow the tent away. There’s also a mesh window at the back, plus the front of the tent folds down for added privacy and protection. I also like how easy the tent is to pack away. It quickly folds back in on itself, allowing you to pop it inside the provided carry case without any issues. Unfortunately, the dark fabric counts against it, as it makes the tent interior too warm on very hot days. A couple of extra mesh windows may also have helped to improve ventilation. 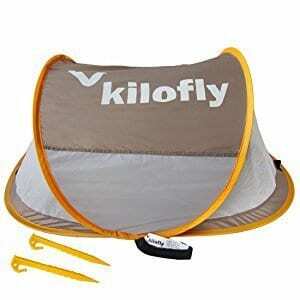 One of the simpler tents on my list, this is another pop up tent that you can set up in a few seconds. You’ll notice a different design with this one, as it has one big sheet that wraps over the top, with another making up the base. It has a 59-inch width and depth, though it’s only 36 inches in height. The tent comprises mostly of 190T nylon, with a mesh back to enhance ventilation. 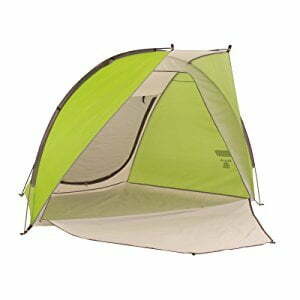 It also has a large opening at the front, with the base extending beyond the arc of the tent. Unfortunately, there isn’t a way to close this opening. You’d expect the durable steel frame to add more weight to the tent, but it’s actually one of the lightest on this list. It only weighs 2.2 pounds, plus it comes with a carry case for easy transport. However, this low weight does make it susceptible to strong gusts, even when you’re using all five of the tent pegs. The material offers UPF 50+ protection, plus it’s CPAI-84 flame retardant, offering that extra bit of protection. 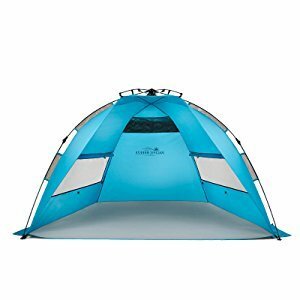 You also get a choice between orange and light blue materials, both of which are light enough colors to stop the tent from getting too warm inside. Unfortunately, it’s not the easiest tent to fold back into place. The instructions don’t do a great job of conveying the steps, so you’ll need patience to ensure you don’t force it and end up damaging the frame. A tent designed with air circulation in mind, the mesh window at the back of this tent unzips to allow more air in. This keeps the interior cool, which may make it one of the best choices for sleeping babies. However, you will have to take care with the positioning if you keep both the window and the front open. Speaking about the front, you can lay it out flat in front of the tent to extend the base. It also folds up and zips into place for those moments when you need a little privacy. The materials also offer UPF 50+ protection all round. It’s 90 inches wide, with a 53-inch depth and 57-inch height. This offers plenty of room for breastfeeding mothers to sit with their babies. In fact, it’s large enough to double as a play tent for toddlers. I particularly like the inclusion of a dry line, which you can use to hang up wet clothes. However, I wouldn’t recommend using it while your baby’s inside the tent. The interior also has some storage pockets for your valuables. Unfortunately, it falls down a little when it comes to set up. While it claims to be a pop up tent, it may take about five minutes to get the frame in place and secured. At least the guy lines come pre-attached, and the tent pegs offer plenty of stability. I’m also wary about the strength of the tent poles, as I don’t think they can withstand windy conditions. Portability is the name of the game with this tent, as it folds up into a tiny package that weighs less than one pound. You’ll barely notice it when trekking across the beach. It also pops into place in less than a minute, so there’s no fiddling around. It only comes with two tent pegs, which may raise some concerns about stability. However, I was delighted to discover how thick these pegs are. There’s very little chance of them snapping or coming loose from the sand. The flat top design also lends to this stability, as it makes it harder for gusts to catch the tent. It also means there’s more space at the top of the tent, though this may not be the tent for you if you want to share with your baby. It’s only 20 inches high, so it’s as much a travel crib as it is a baby tent. I also like the focus on safety, as Kilofly ensures that all materials are free of lead and toxins. The mesh base allows air to circulate, while the UPF 35 fabric on top offers shade and protection. The base contains no padding, which lowers the risk of Sudden Infant Death Syndrome (SIDS). Of course, the small size means it’s not ideal for playing or breastfeeding in. Furthermore, the mesh at the bottom also lets in a lot of sand, which may disturb your baby’s sleep. Made using 100% breathable cotton, this 72-inch high tent takes the all-natural approach. It also features a five-pole design, with the eucalyptus poles digging into the ground in place of tent pegs. 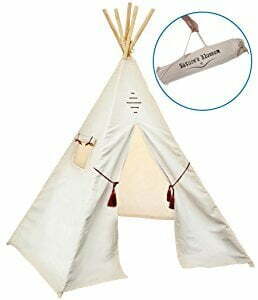 This design choice also means that it offers more internal space than many other teepees. It doesn’t offer the convenience of a pop up tent, but the detailed instructions walk you through the set-up and packing away. It also comes with a carry case for easy transportation. The use of cotton does add to the weight though, bringing it up to 7.7 pounds. The tent doesn’t have a base, so you may need to use a towel to ensure your baby doesn’t get covered in sand. Furthermore, this means you can’t weigh the tent down using items on the base. However, this lack of a base does mean that you can build sandcastles with your baby while protecting them from the sun. A couple of mesh windows aid in ventilation, plus the light coloring prevents the tent from getting too hot inside. You can also clean it easily with a cloth and some warm, soapy water. I also like the little tassels, which you use to keep the front open. Unfortunately, they’re not as sturdy as the rest of the tent, and may fall off after a few uses. You have a lot of options open to you when it comes to protecting your little one on the beach. Some parents prefer a combination of beach umbrellas, sunscreen, and protective clothing. While this protects against UV, it doesn’t offer much protection from the elements. A beach tent is the next step up, and allows you to keep your baby under wraps for the entire trip. However, there are several key considerations that I think you need to keep in mind when making your choice. 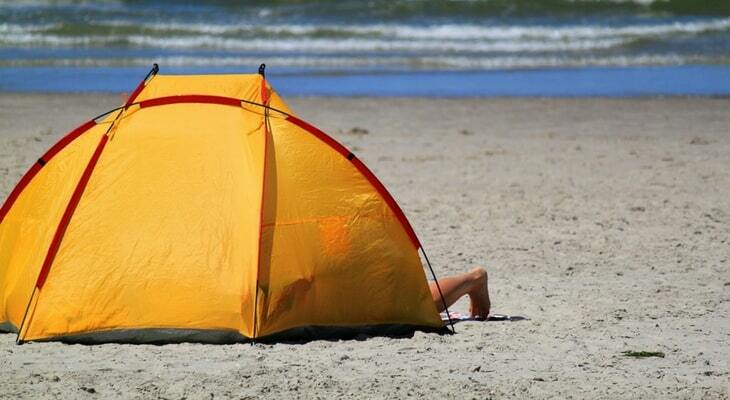 Most parents focus solely on sun protection when picking a beach tent, but ventilation is just as important. If air can’t circulate inside the tent, the interior becomes too hot for a baby. Too much heat leads to dehydration, which can have serious ramifications. Look for the presence of mesh windows in the fabric, and check that the front door opens fully. It’s a bonus if the mesh windows open, but it’s not essential. It also helps if the manufacturers use light colors for the tent. As a general rule, a base that connects to the rest of the tent fabric offers more protection for babies. It prevents sand and creepy crawlies from getting to your little one. Plus, it gives them something more comfortable to lie on. The only exception to this is if you want to play in the sand with your baby inside the tent. This requires a baseless tent. If you go this route, bring a beach towel that covers the whole base of the tent for when your baby sleeps inside. I mentioned the hazards of sun exposure above, and they’re why most tent manufacturers build UV protection into their fabrics. The higher the UPF rating, the more UV rays the tent blocks from reaching your baby. Most beach tents pop into place quickly these days. However, a few still require you to fiddle around with poles and tent pegs. These take more time to set up and pack away, however, the more deliberate process means there’s less chance of snapping an in-built frame. You’ll often find that such tents offer more stability than the pop up variety too. If you’ve ever spent ages searching for the perfect spot on a beach, you know how frustrating it is having a bunch of equipment weighing you down. Lightweight tents can help. But the lighter the weight, the less protection the tent offers against wind. 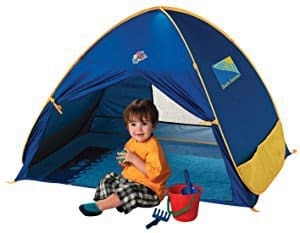 A baby beach tent may be the best way to protect your baby from the sun’s harmful rays, as well as the other elements. However, you need to put time into making your decision. The wrong choice may leave you with a tent that offers shade, but little else. Babies need plenty of air circulation, and should not have to withstand high temperatures. Consider both issues when making your choice, as the tent material’s UPF alone isn’t enough to base a decision on. I believe the tents on my list offer everything that a parent needs to keep their little one safe at the beach. Some are even large enough to last through the toddler years too. Examine my selections and use the information I’ve provided to find a baby beach tent that suits your little one’s needs.